As the winter snow melts away to reveal the green grass of spring, roof damage and leaks can also be revealed. Since winter is particularly hard on your roof, this is the perfect opportunity to inspect it and identify potential causes of a commercial roof leak. Once the weather starts warming up, you should immediately begin looking for signs of deterioration both inside and out. Commercial roof leaks have many indicators, the most obvious ones inside the building being stained ceiling tiles and water dripping on the floor. On your roof you should be on the lookout for billowing membrane, loose flashing, split seams and mushy insulation. Once you know the signs of deterioration, you can start to understand why you have a commercial roof leak. Below we list five reasons your roof may be leaking this spring. Winter is a constant battle between warming and freezing temperatures. This can wreak havoc on your roof’s membrane. The expanding and contracting of the materials can cause shrinkage, pull the membrane away from walls and penetrations and separate the membrane’s seams. Your efforts to keep snow off your roof to protect your structure may have actually caused damage to your roof’s membrane. If you shoveled your roof using a shovel with a metal edge, you may have cut your membrane, resulting in a roof leak. Hiring a roofing contractor to remove snow from your roof can help prevent damage. Whipping winter winds can litter your roof with tree branches and other debris. When winter weather hits debris can be trapped between layers of snow and ice. As the snow and ice shift and melt, the debris can damage your roof’s membrane and flashings which can lead to tears and rips. Sound flashing is crucial to a roof’s health. Flashings will often fail before the roofing system does, so it’s important to inspect them carefully. Damaged flashing can let water in a roof system, causing a commercial roof leak. You should look for deteriorated sealant, splits in flashing seams and membrane being pulled away from walls and penetrations. Sealants require regular inspection and often need to be re-caulked. Sealants that show signs of damage may be the cause of your roof leak. If your sealant has significant damage, it’s best to have a professional repair it. First thing’s first, you don’t want to let the water from your roof leak drip all over the place. Make sure there is nothing in the vicinity that will be damaged by the water. Next, use a bucket to capture the leaking water. Now that you have that handled, call Bloom Roofing at 248-264-7200. Our experienced technicians are able to identify the best and most cost-effective ways to fix your problems. For further help inspecting your roof this spring, take a look at our Spring Maintenance Guide. We also offer commercial roof inspection, repair and replacement services. 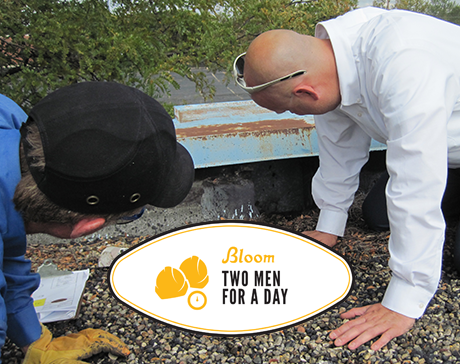 Our biannual roof inspection and Two Men For A Day program are the perfect preventative measures if you have concerns about your roof. 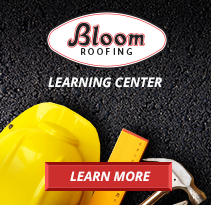 By inspecting your roof proactively, you may be able to prevent a commercial roof leak or prevent further damage from one you identified this spring.